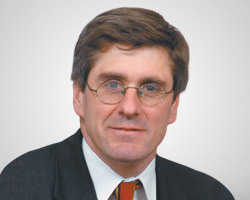 Stephen Moore, who formerly wrote on the economy and public policy for The Wall Street Journal, is the Distinguished Visiting Fellow, Project for Economic Growth, at The Heritage Foundation. Mr. Moore, who also was a member of The Journal's editorial board, returned to Heritage in January 2014—about 25 years after his tenure as the leading conservative think tank's Grover M. Hermann Fellow in Budgetary Affairs from 1984 to 1987. He is the founder and former president of the Club for Growth, which raises money for political candidates that favor free-market economic policies. He has served as a senior economist on the Congressional Joint Economic Committee and as a senior economic fellow at the Cato Institute, where he published dozens of studies on federal and state tax and budget policy. Mr. Moore is the author of five books, including Bullish on Bush: How the Ownership Society Is Making America Richer. He graduated from the University of Illinois and holds a Master's degree in economics from George Mason University.